New data by Lazard, a financial advisory firm, shows that prices for renewable electricity declined again this year, continuing their downward trend. But the data, released last month, miss another critical clean energy resource. Energy efficiency–the kilowatt-hours we avoid by eliminating waste–remains, on average, our nation’s least-cost resource. Efficiency also delivers a host of other benefits. It improves electric grid reliability and resilience, can target savings where and when needed the most, creates jobs, spurs other economic development, reduces customer utility bills, makes homes and buildings more comfortable, and reduces harmful pollution. ACEEE research published this summer shows that energy efficiency programs cost utilities, on average, about 3.1 cents per kilowatt-hour nationally. It examines program costs and performance incentives for the 49 largest US electricity utilities in the 2015 program year (the data do not include additional participant costs). Lawrence Berkeley National Laboratory (LBNL) has found similar results in an analysis of 2009-2015 program year data (with a few differences in approach). It has also examined the total cost of efficiency programs, including participant costs. 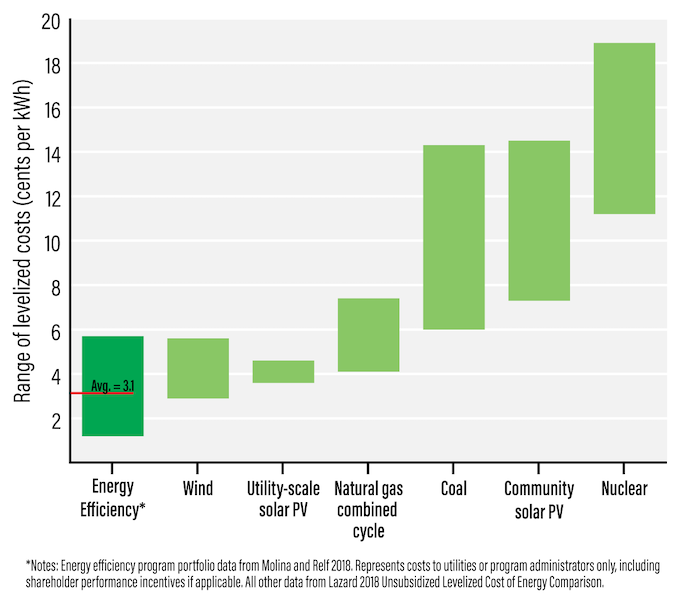 The average cost of efficiency to utilities is still generally less than that of wind or utility-scale solar. And overall, energy efficiency and clean energy continue to come in at a lower cost per kilowatt hour than more traditional resources. Worth noting, these are national data; regional data will vary. Also, the levelized cost data in the Lazard analysis and our paper are a simplified and limited metric and they do not tell the full story of the benefits of energy efficiency (or other resources) to utilities. For example, the Lazard data do not include costs for needed storage or transmission and distribution. How big are efficiency investments? Investments in energy efficiency can have a big impact. Those made between 1990 and today have helped us avoid building the equivalent of 313 large power plants and have delivered cumulative savings of nearly $790 billion to customers nationwide. The need and opportunity for efficiency as a utility resource will continue in the coming years as states and utilities will need to meet evolving goals. For example, investments in transmission and distribution have grown significantly over the past decade. This trend means higher costs for customers. Energy efficiency can help keep these costs in check by serving as both a broad-based resource and a distributed energy resource that meets specific time and locational needs on the grid. Efficiency also has a large role to play in reducing emissions and meeting aggressive climate goals for many states and cities. The good news: Utilities are increasing efficiency investments, helping their customers use energy more efficiently, and meeting demand by saving energy rather than generating it. A recent LBNL analysis projects, in its medium case scenario, that utilities will increase efficiency investments from $5.8 billion in 2016 to $8.6 billion in 2030, a jump of more than 45%. But will this, or even the LBNL study’s high scenario, be enough to meet states’ growing energy and climate policy needs? Not likely. New and refined policy tools will be needed, such as the next generation of energy efficiency resource standards, utility business models aligned with efficiency, and financing options that help businesses and households leverage public and ratepayer funding to drive deeper savings. Check out our State Policy Toolkit, which can help state policymakers and regulators increase use of our nation’s least-cost energy resource.